Muscle tissue is made of specialised cells that use energy from the hydrolysis of ATP to become shorter by contraction. Striated (skeletal/voluntary) muscle attaches to the bones by tendons and appears stripy under a microscope. Skeletal muscles contract and relax to move bones at a joint. The cells in striated muscle are highly specialised muscle fibres. Each fibre contains many nuclei (multinucleate), mitochondria (provides ATP for contraction) and sarcoplasmic reticulum (contains calcium ions). The cell membrane of a muscle fibre is the sarcolemma. Parts of the sarcolemma fold inwards across the fibres and stick into the sarcoplasm (cytoplasm containing organelles such as mitochondria). These folds are fibules and help spread electrical impulses through the sarcoplasm. 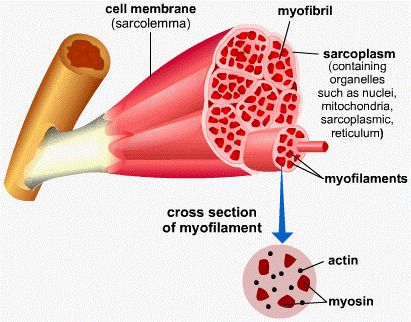 Muscle fibres are made of myofibrils, which are made of many short units called sarcomeres. The ends of sarcomeres have a Z line and the middle has an M line (attachment for myosin). They contain bundles of protein filaments (myofilaments) called actin and myosin which move past each other to make muscles contract. When the muscle contracts, the dark band overlaps the intermediate band, shortening the length of the muscle and the sarcomere. Function Locomotion Pumping blood through heart Line blood vessels, digestive tract, uterus etc. Within striated muscle tissue, there are two types of muscle fibre. Fast twitch fibres are adapted for rapid contraction over a short period of time. Slow twitch fibres are adapted for less rapid contraction over longer periods of time (continuous activity). Muscle contraction works as actin and myosin filaments slide between each other, causing the sarcomeres to become shorter, shortening the whole muscle fibre. When the muscle is not longer being stimulated, calcium ions are moved back into the sarcoplasmic reticulum by active transport (using ATP). The troponin molecules move back to their original shape and the tropomyosin blocks the actin binding sites. This means the myofilaments cannot slide past each other because the myosin heads cannot bind to the actin. The actin filaments slide back to their relaxed position, lengthening the sarcomeres. Striated muscles are attached to the skeleton by strong, inelastic tendons. Tendons are made of long fibres of the protein collagen, and small amounts of elastin. When a muscle contracts it pulls on the tendons which transmit a force. Bones are connected at joints such as finger joints, elbow joints and synovial joints. Ligaments hold these bones in synovial joints together. The hip, knee and ankle are synovial joints. They are where the bones in the joint are separated by a cavity filled with synovial fluid, secreted by the synovial membrane. This acts as a lubricant and allows for free movement. Ligaments also contain collagen and elastin but have a higher proportion of elastin, so they can stretch more than tendons. Ligaments control and restrict the amount of movement in the joint. Cartilage is firm and elastic, it protects the bones within the joints. Cartilage absorbs synovial fluid and acts as a shock absorber. Muscles produce a force when they contract. When they relax, they stay in the same position unless pulled to their lengthened state. 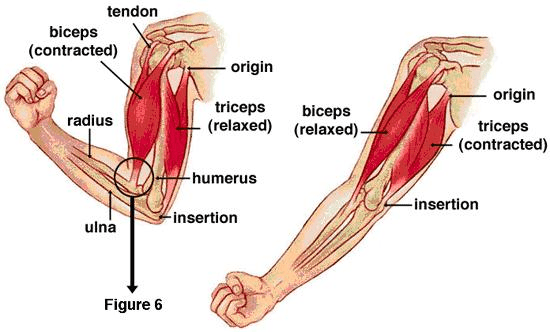 For example the major muscle causing the arm to bend at the elbow is the biceps, known as the flexor muscle. The triceps are the extensor muscle, causing the arm to straighten when it contracts. As the arm bends, the biceps contract and the triceps relaxes, although it may contract slightly to control the movement. Muscles can only pull they cannot push, two work together for movement, they are antagonistic muscle pairs. When one muscle is contracting, the other is relaxing. Sarcoplasmic reticulum: Membrane-bound sacs around the myofibrils which release calcium ions for muscle contraction.